I just bought a home on well water and found out the well has coliform bacteria. I understand I can use an ultraviolet light filter to kill the bacteria, or I can install a chlorinator. My water has some iron in it, and occasionally we do get the rotten-egg sulfur odor.. 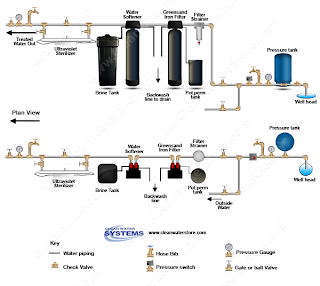 Which type of system is best for my water? There are a few options available for treating this situation, and the two most common are UV treatment and chemical treatment. Ideally, to be certain you are achieving proper disinfection, we always recommend using both for a double barrier effect. However, complete sterilization can be achieved with one or the other. Either way, it is good to proceed with caution and plan accordingly. I am including some more information on both options below. First you should try to find out and eliminate the source of the coliform bacteria. Check this link for more information: http://www.cleanwaterstore.com/bacteria.php You might also consider sanitizing the well and shocking with chlorine, and then re-testing the water for coliform bacteria. To kill bacteria, the first and more common option uses chlorine injection with the use of a metering pump, which provides extra strength oxidation for coliform bacteria, as well as strong odors and high levels of iron and manganese (which can be linked with sulfur odors). The chlorine would then feed into a contact tank to provide enough time for the solution to react with the bacteria in the water, disinfecting it for good. 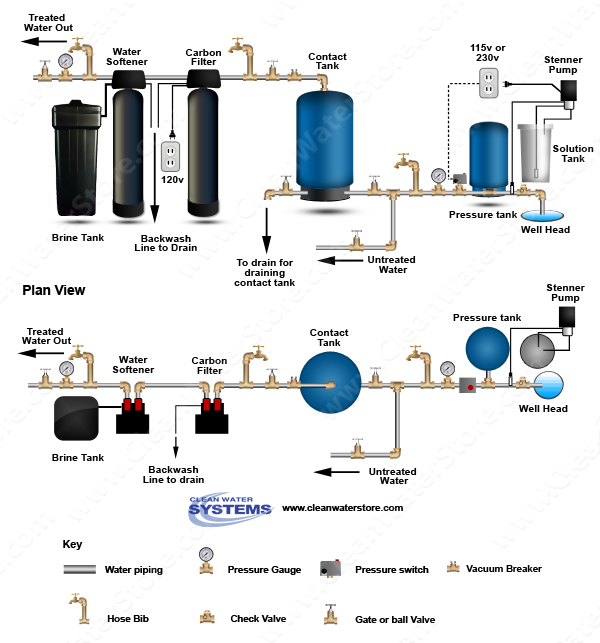 You could, as an option, send the water through a carbon filter to then remove the chlorine taste and odor completely. Because chlorine injection maintains a regular residual of chlorine throughout the pipes of your home, it is the more reliable and safer method. The second method is a UV system for your whole house. Ultraviolet sterilizers work by exposing the cell walls of an organism to intense UV light which disrupts the genetic material and prevents the organism from reproducing. UV effectively destroys bacteria and viruses but is limited by the clarity of the water. UV only works on water that is clear and has a high UV transmission rate. Unlike chlorine there is no downstream residual disinfection. 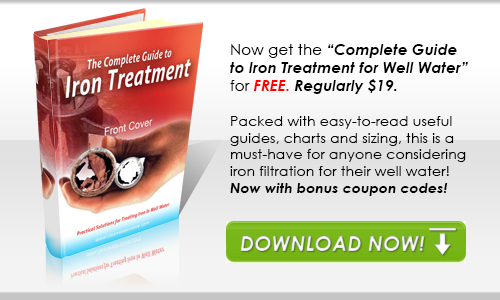 Pretreatment for iron, sediment and excessive hardness minerals is recommended. 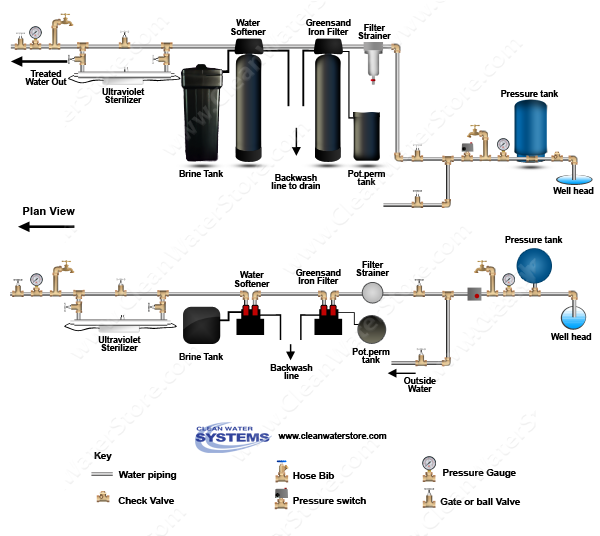 Includes 1.5 cubic feet of Carbon filter media; and Fleck 7000 115v control valve. 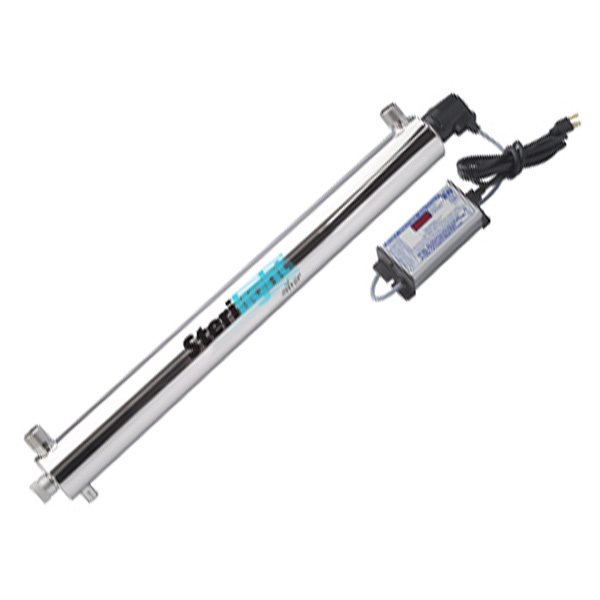 · Sterilight® point-of-use disinfection systems are specifically designed to treat microbiologically contaminated ground or surface waters. · These disinfection systems offer a 4-log reduction (99.99%) in bacteria, virus and protozoan cysts (specifically Giardia Lamblia and Cryptosporidium). Dimensions: 3 inches diameter x 20 inches length.